The Beirut Groove Collective kicked off their Superstar Sessions Series on Saturday with an evening of throbbing beats at the Interneon Studio on Yazbakieh Street. The venue itself offers a peculiar open plan setting, with bass lines from tracks spun by Natalie Shooter and Christelle Franca rippling across the brightly colored brick walls and the entire room acting as one big dance floor. But as the crowd filled the space, any excess sound was sucked up by twisting bodies and fancy footwork. To a backdrop of some fine visuals by Tarek Chemaly, DJs Brother Jackson, Heavy G and Ernesto played a combination of edgy funk and skin tight break beats, topped off with live vocals by Ed from FareeQ El Atrash. DJ Lethal Skillz, who was very much the main course of the evening’s matinee, took to the stage with the intention of blowing the crowd off their feet with an arsenal of punctuated beats. His set was accompanied by live trombone work by Tom Bone, who added layers of depth and innovative melodies to an already stand out performance. The night ended as it had begun, with DJs STICKFIGGR and BGC keeping the groovers moving until they could groove or move no more. There was only question being asked by the time the crowd staggered back out onto to Yazbakieh street. When will we get to party like this again? 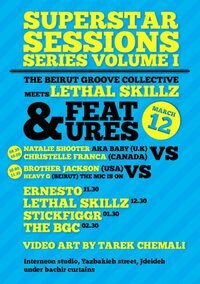 This entry was posted in Live review and tagged beirut, Beirut Groove Collective, DJ Lethal Skillz, live music, music. Bookmark the permalink.